Light pollution has become a serious problem for nightscape photography. Today, even in remote locations the skies are spoiled by an ugly orange tint. 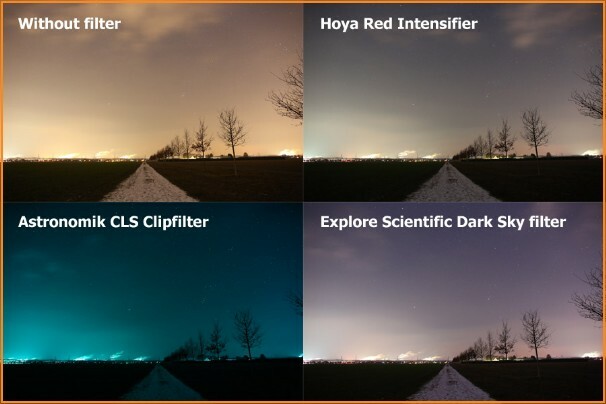 Fortunately, there are photographic filters which suppress the light pollution. The test was performed both on a Canon EOS 5DIII and on an astromodified Canon 6D. You are looking at unprocessed JPEG output, taken with 3200 Asa, 4500K and 8sek exposure time on a Canon 24mm f1.4 lens stopped down to 2.8. The shots were taken in the outskirts of Cologne. The night was a little bit hazy with a lot of light pollution. Please deactivate the automatic image size adjustment of your browser to check detail. 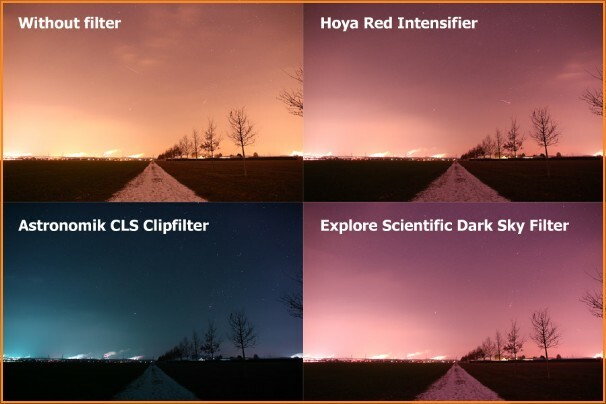 Both the Hoya and the Explore Scientific filter give good results with the Canon 5DIII. The Explore Scientific is showing a nicer tint. The Hoya is providing a very little bit darker sky. 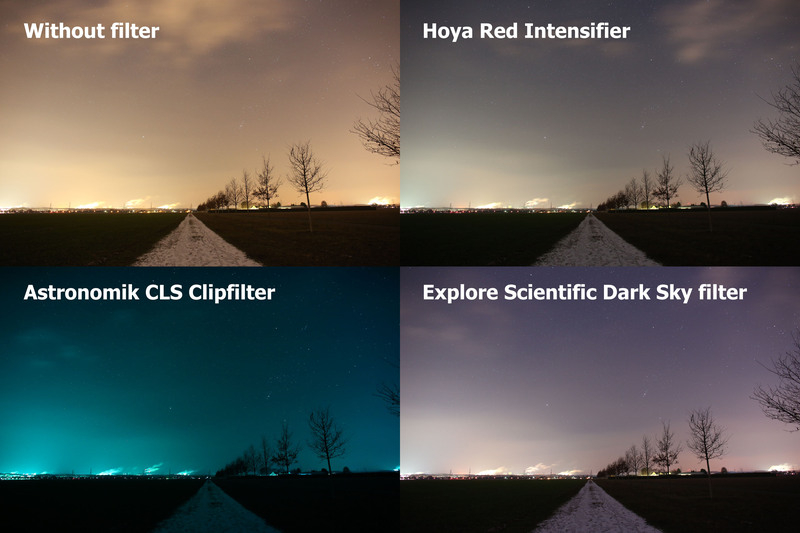 The Astronomik CLS filter gives quite an unnatural colour which can hardly be corrected in post processing. 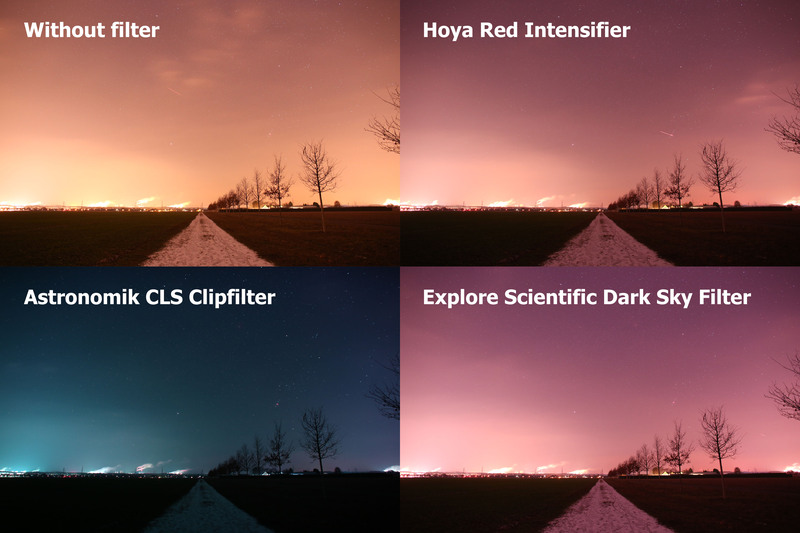 The Astronomik CLS filter is showing an extraordinary good result with an astromodified Canon 6D. The sky is dark, many stars are visible and the tint can easily be optimised in post processing.